The son of Sir Bobby Robson said the family has "realised what sort of person dad was" since the football manager's death almost 10 years ago. Mark Robson spoke to BBC Radio Suffolk ahead of a screening of a film on Sir Bobby's life and career, including his FA Cup win at Ipswich Town. More Than A Manager features archive footage and interviews with family, players and fellow managers. "The joy and respect for dad comes through," said Mr Robson. "It's since he's passed away that we've realised what sort of person dad was. "A leader, his passion, his generosity. "He had rhino skin, because he had to, but he was also extraordinarily warm. "He believed in people, he believed in players. That believing is why players performed for him, when he went from club to club, and they wanted to produce for him." Sir Bobby, who also managed Newcastle United, England and FC Barcelona, was diagnosed with cancer in 1995 and given just months to live. He died in 2009, aged 76. The film documents his own playing career, Diego Maradona's infamous "Hand of God" goal at the 1986 World Cup, his success in European football and his love for Newcastle United. It features anecdotes from Gary Lineker, Terry Butcher, Sir Alex Ferguson, Paul Gascoigne and Alan Shearer. 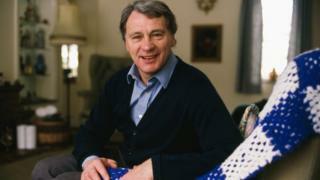 Mark Robson and Sir Bobby's widow, Lady Elsie, who both feature in the film, are due to attend the screening at Ipswich's Portman Road stadium. Mark said his mother - "a very private person" - was "one of the stars of the show" and that Sir Bobby's 14 years at Ipswich Town story was a key element. "It's a rollercoaster of a film, very emotional," he said. "The timeline jumps back and forth so it holds you and then it accelerates you forward." More Than A Manager is on general release from 1 June.